Ensure you never miss the latest success stories, information and advice from Cats Protection by signing up as a subscriber to the official Meow! blog. Whether it’s an inspiring tale of an unwanted cat finding a loving new home, feline veterinary and behaviour tips or a day in the life of a Cats Protection volunteer – you’ll find pages and pages of useful and interesting cat-themed topics. Just pop your email address in the field in our sidebar (look for 'Subscribe via email') to receive instant emails every time we publish a blog post. You can also keep up-to-date with all the latest from the charity by following us on our national social media profiles or via our national website. I don't use any social media sites. Hi Sian, here on our blog you'll find all the latest rehoming success stories, campaigns, information and advice from Cats Protection. 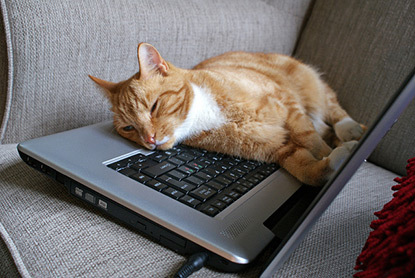 If you don't have access to any social media sites then you can follow us here or have a look at our national website at www.cats.org.uk. Hope this helps.